My oldest daughter has started to live her dream. She has been working and saving, and last month she (with my husband and my mom on the team, too) went on a mission trip to Nicaragua. I’ve loved hearing all about it. The picture I shared last week is when she traced feet to find shoes that fit. They were able to purchase complete uniforms including leather shoes for only about $16 per child. They also packed and passed out bags of food, and until they ran out they also passed out Bibles. 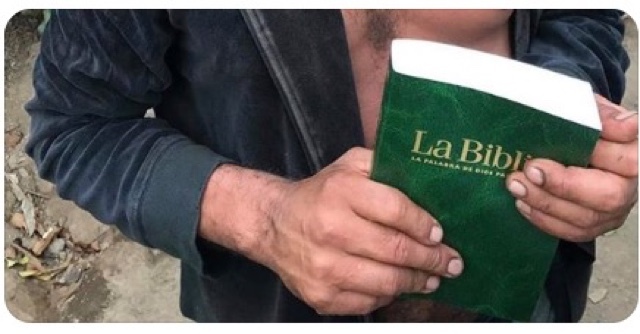 The picture is of just one of those who received a Bible. My daughter said that this man cried and kissed it. That's so exciting for your daughter. I will keep her in my prayers! What a great adventure for your daughter! I've been to Nicaragua once and will be going back this year! What a beautiful place and a wonderful opportunity to minister to the wonderful people! Where in Nicaragua do you go? They went with SHEO to Los Chirinos/Masetepe. (I may have spelled that wrong.) My mom has been many times, and now our whole family wants to go. What a blessing your daughter is to have that dream in her heart. Tell her thanks. Glad you shared her story with us. Oh how wonderful and exciting for your daughter and what a great picture to share!! Thank you so much for sharing her experience here! This. This is a beautiful picture!! How exciting for your daughter!